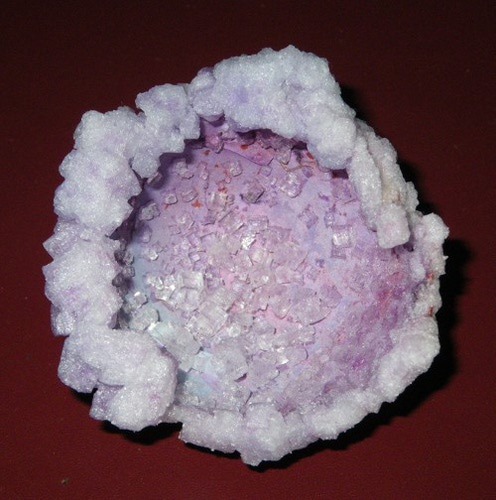 It’s easy to make your own crystal geode using an eggshell and salt, plus it takes a lot less time than waiting for Mother Nature to make a geode. Geodes are natural rock formations that often take millions of years to form, as minerals crystallize in cavities in the stone. The kind of geode you can make still consists of minerals, but it takes a lot less time to grow the crystals. A natural geode forms when crystals deposit inside another mineral. Your mineral is the calcium carbonate of an eggshell. To get the base for the geode, crack open an egg, remove the egg, and keep the shell. Rinse out the shell and let it dry. Find a small bowl or cup that is bit larger than your eggshell. Boil enough water to fill the bowl. An easy way to do this is to fill the bowl with water, empty the water into a glass measuring cup, and microwaving the water until it boils. Make a saturated salt solution. Stir salt into the boiling hot water until no more salt will dissolve. You’ll know you have a saturated solution when a few crystals remain at the bottom of the container. The solubility of salt depends on temperature, so it’s best to use boiling hot water. If you want colored crystals, add a few drops of food coloring to the solution. Place the eggshell in your container. Pour the salt solution into the shell. It will overflow the shell, which is fine. Pouring the solution into the shell keeps it from floating. Crystals will start to form as the solution cools and water evporates out of the container. You may get good crystals overnight or it may take a couple of days to see good growth, depending how saturated your salt solution was. When you are pleased with the crystals, remove the geode from the liquid and place it on a paper towel to dry. Display your crystal geode or wrap it in paper if you wish to store it. You can dust it, but don’t expose it to water or your salt crystals will dissolve. How does the salt stick to the egg shell? Sodium chloride is an ionic crystal. It doesn’t seem to have any problem sticking to the calcium carbonate (ionic) that makes up an eggshell. ← What’s That Sound? Science Solves The Mystery Of Bio-duck!